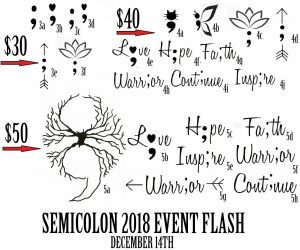 Thank you to our friends at St. Charles Tattoo, who will host their 3rd annual Semicolon Tattoo Event on Friday, December 14, from 10 am to 9 pm. The semicolon is a powerful mark for those who have faced suicidal thoughts and symbolizes the moment they could have chosen to end their sentence but instead kept going. Provident will be on-hand at the event with information about mental health and suicide prevention. Proceeds will support our life-saving programs. Visit https://www.stcharlestattoo.com for more information.